Rome is full of wonderful and exciting places to eat out, with a wide choice of every kind of food imaginable. The many stylish locations and enormous variety of excellent, mouth-watering menus provide nothing short of culinary perfection. Whether you are looking for a romantic meal for two or trendy, lively dining, the only problem is deciding where to go as there are so many Rome restaurants to choose from! Bars in Rome mainly function as cafés, although they do serve alcohol. Prices vary depending on whether you are seated at a table and being waited upon, or simply standing at the bar - which can be as much as half the price. Typical Roman bar foods include such treats as panini sandwiches and tramezzini, which are large white bread sandwiches, flattened and toasted. 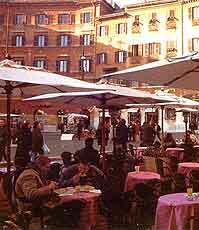 Rome is blessed with an abundance of great street cafés that sell a variety of wonderful snack food and light lunches. They serve a whole range of Italian specialities, such as pizza slices, pasta dishes, sandwiches and superb salads, often served with Italian cheeses. At many of the restaurants in Rome there are either menus of the day (menu del giorno) or special tourists' menus (turistico). These have set meal prices, which usually include all courses, service charge and house wine. However, the meals are often quite basic and may be a little bland. For a wider choice and possibly better food, the fixed-price menu (menu à prezzo fisso) may prove to be a better option. In most restaurants you will also find a good menu of some of Italy's finest wines to enjoy with your meal. There are many different types of food served in Rome's restaurants, but amongst the most popular are pizzas and pasta. Pizzas can be either eaten in a pizzerie, where large, round, thin pizzas are cooked in traditional wood-burning ovens, or alternatively, you can order pizza by the slice in a 'pizza à taglio' and either eat it at one of the small tables or take it away and enjoy it, whilst admiring the nearby architecture of the city. Other food sold at takeaway outlets includes a variety of sandwiches, rolls and even freshly roasted chickens. Pasta comes in an enormous array of shapes, colours and styles. Probably the most popular type most often served in local restaurants is spaghetti. Served with sauces, including olive oil and garlic, or rich tomato and basil, these meals are simple, but very tasty. Many gnocchi dishes are also usually available and are often served with a meat sauce. For vegetarians, there are plenty of alternatives in all Italian restaurants and these usually include wonderful fresh vegetables and cheeses. There are also restaurants that specialise in vegetarian cuisine, serving delicious meals. Eating out in Rome is something that should not be rushed and meals tend to range from good to exceptional. Most restaurants in Rome offer standard traditional Italian dishes, some quite regional, although many offer much more besides. 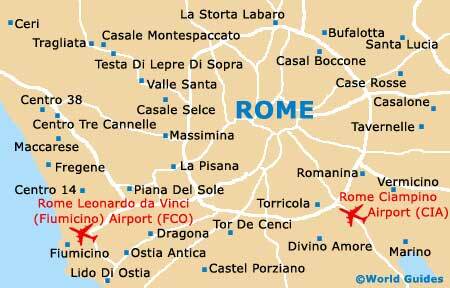 Prices are generally very reasonable and a meal in Rome is usually money well spent.